Amazing setting and views of the caldera. Great patio area with your own small pool. Location is absolutely perfect. The hosts are also friendly. 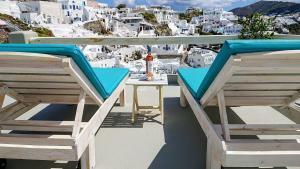 The property has perhaps the best views of Oia. Room is a good size and coffee machine is nice. The view is incredible and can't be beat. The host's were awesome, friendly, helpful and very available and responsive. The room and patio were super clean and everything worked well. The food the left for breakfast was great and you could snack all day long. The location with the view is just amazing. In the heart of Oia. Owners were very friendly. We had a great visit at this property. The location is terrific right in the middle of Oia's Main Street and not too far from the carpark/bus stop so it's not a pain to drag luggage. The host (Artemis) was friendly, flexible, helpful, easily accessible with a personal touch. She arranged our transfers and our caldera cruise. She even dropped off a blow-up balloon for the 3yo in our group! Great view, clean,& nice. The host was super nice. I love the stay, so pleasant! The owner of the house Artemis and George are warm and very welcoming people. The moment we arrived until we left Artemis treated us very well, and gave us all the information about the town of Santorini. They also helped us with our luggage to take it to the house which was very helpful. The two bedroom house was large enough for my family of 4 and well maintained. The front portion of the house has a amazing view. It also has the brand new Hot tub which over looked an amazing view. This house also have a dinning area and a small cute kitchen. Over all we love this house and enjoyed our stay there! Artemis was an excellent host who greeted us personally with a charming and friendly welcome. The location is extraordinary. I'd highly recommend! Artemia md George were extremely accommodating and helpful. Our flight was extremely early and they were gracious enough to let us check in earlier than normal. They were both very helpful in helping plan our stay. Would absolutely stay there again. A beautiful cave apartment with a view that cannot be beat. Artemis and George were generous and kind hosts as well, which added that extra touch. Lock in a great price for Aqua & Terra Traditional Cave Houses – rated 9.2 by recent guests! 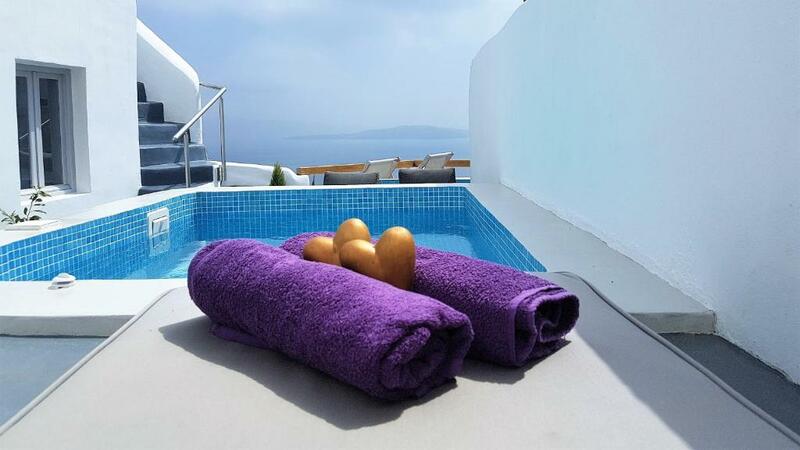 One of our top picks in Oia.Aqua & Terra Traditional Houses offers peaceful, beautifully renovated traditional houses in Oia, each with a heated plunge pool with hydromassage jets. 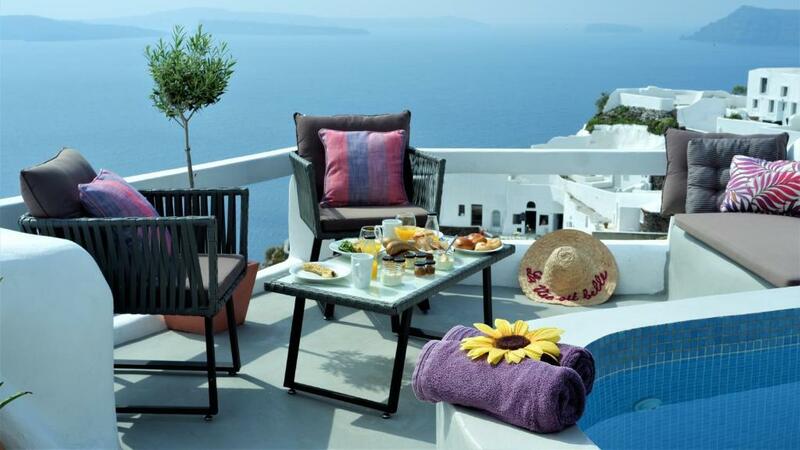 Guests enjoy views over the Aegean Sea and the Caldera from their private or shared verandas. Homemade breakfast is available. The atmospheric apartments and studios come equipped with kitchenette. The décor varies from one to the other, but all rooms have characteristic island furniture, including stone-base beds. Sheets are changed every 2 days, while daily housekeeping and change of towels is provided. In-room massage appointments can be booked. The hosts will help with any aspect of your stay, including organizing transfers to the port or airport or arranging a picnic lunch for a day at the beach. Free Wi-Fi is available in the reception area. Aqua & Terra Traditional Cave Houses is 16 mi from the airport and the port. Downtown Fira is 8.7 mi. The nearest beach of Baxedes is 1.9 mi away. When would you like to stay at Aqua & Terra Traditional Cave Houses? -daily housekeeping and change of towels. 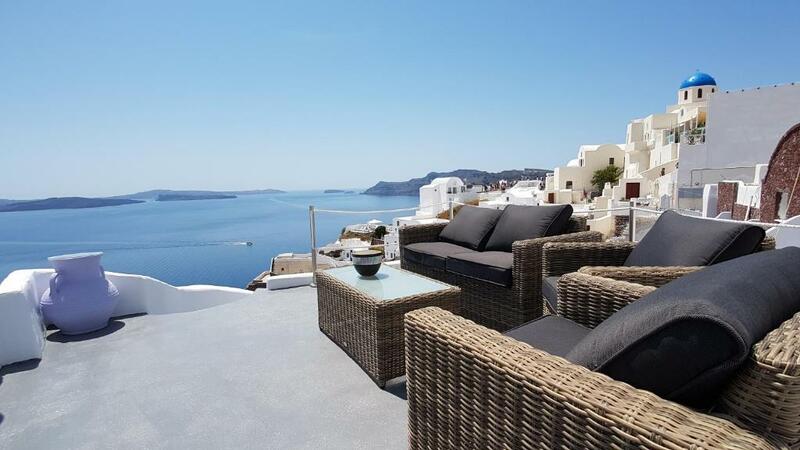 Built on the volcanic rock in the scenic village of Oia, Aqua & Terra traditional houses offers Cycladic-style rooms and amazing verandas with stunning view over the caldera and the volcano. It can accommodate 2-5 person. Ideal for a family, or for two couples, up to 5 persons There is enough space , big terrace, tables and sunbeds for all the guests of our houses The view from our balcony is just amazing and breathtaking! Our hospitality is more than ςαρμ. We are locals, so we know Santorini very good. We can suggest you what is worth to visit here, the best restaurants and the activities you should do on the island. Oia is the most traditional and popular village in Santorini. House Rules Aqua & Terra Traditional Cave Houses takes special requests – add in the next step! Aqua &amp; Terra Traditional Cave Houses accepts these cards and reserves the right to temporarily hold an amount prior to arrival. Aqua & Terra Traditional Cave Houses accepts these cards and reserves the right to temporarily hold an amount prior to arrival. Please inform Aqua & Terra Traditional Cave Houses of your expected arrival time in advance. You can use the Special Requests box when booking, or contact the property directly using the contact details in your confirmation. Lack of privacy, noise from the main pedestrian walkway just above the property. Thankfully we were only there for 2 nights. Internet is dreadful. I had a feeling when it was explained that there was a switch to turn the router on and off, then it must be a regular issue. I rely heavily on internet access for my work, and even outside sat next to the router, was not reliable or steady connection. Didn’t sleep well because the house owner and cleaner attend the property very early (8am) and every word can be heard, talking or chatting on the phone. Also no blackout on the windows, so the bedroom gets light. This happened both days we were there. Secondly, the courtyard, although has spectacular views, is shared with another property. Therefor, we were also awaken by the other 4 people in the other property who fancied having their breakfast, rightly so, in the county yard at 9am. If you’re not a morning person, it’s not for you. If you’re after privacy, it’s not for you. I understand that Santorini is not the destination for privacy, but I prefer something a little less intrusive than this. On holiday I like privacy and peace. I would recommend this property for good value for money, or for people who don’t mind sharing the countyard, or who rent both rooms with family /friends. The hot tub is also too cold to use this time of year. Aside from that, the room is nice, the complimentary wine is nice, and the room is spacious. Shared patio. Didn’t bother us but might bother some. Steep walk down but we did fine. No microwave. Again didn’t bother us but might bother some. Cleaning lady showed up each morning around 8. Again, we were up but some may not be up. Wish dipping pool was a tad bit warmer for night time. You need to be very aware that the patio area and pools are in a small common area. This is no problem if you get along with your neighbors but if like us 6 20-somethings move into the room and want to take over the patio it can be very uncomfortable. The larger room has the front pool the smaller room has the back one. I wish shampoo, conditioner & lotion was available. Breakfast was not too exciting. I love the location and the cute, unique cave house design. 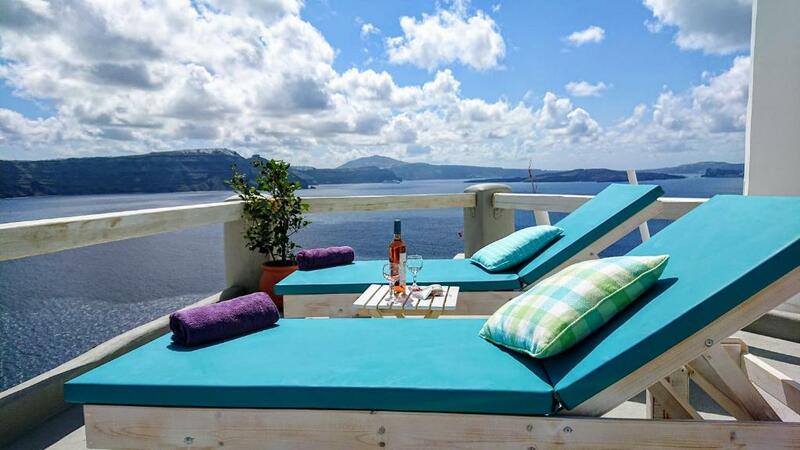 Best location in Santorini. We had a wonderful time! Thank you so much!!! The property exceeded our expectations. Artemis is perfect...she is very hospitable. We stayed at House Two and it was perfect for the family of 4. Bonus is that breakfast is provided. 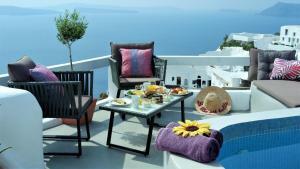 We would definitely recommend Aqua Terra to my family and friends if they are visiting Santorini. Terrace and hot tub area are a shared area. 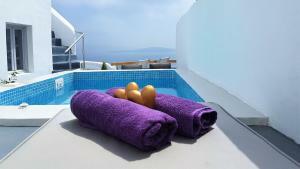 Two hot tub in the terrace for two different room wich does not give any privacy if you are traveling as a couple. Its definitely not the place to be if you are looking for a romantic stay. More than one set of keys for the large group.